SAN JUAN, Puerto Rico (AP) — Puerto Rico’s nonvoting representative in the U.S. Congress said Sunday that Hurricane Maria’s destruction has set the island back decades, even as authorities worked to assess the extent of the damage. Engineers on Sunday planned to inspect the roughly 90-year-old Guajataca Dam, which holds back a reservoir covering about 2 square miles (5 square kilometers) in northwest Puerto Rico. The government said it suffered a large crack after Maria dumped 15 inches (nearly 40 centimeters) of rain on the surrounding mountains and that it “will collapse at any minute.” Nearby residents had been evacuated, but began returning to their homes Saturday after a spillway eased pressure on the dam. Puerto Rico’s National Guard diverted an oil tanker that broke free and threatened to crash into the southeast coast, said Gov. Ricardo Rossello, and officials still had not had communication with nine of 78 municipalities. “We are trying to get an understanding of the extent of the damage over the next 48 hours to then begin to work with our federal partners to get the right crews and equipment down to Puerto Rico,” Hyland said. Large amounts of federal aid have begun moving into Puerto Rico, welcomed by local officials who praised the Trump administration’s response but called for the emergency loosening of rules long blamed for condemning the U.S. territory to second-class status. The opening of the island’s main port in the capital allowed 11 ships to bring in 1.6 million gallons of water, 23,000 cots, dozens of generators and food. Dozens more shipments are expected in upcoming days. The federal aid effort is racing to stem a growing humanitarian crisis in towns left without fresh water, fuel, electricity or phone service. 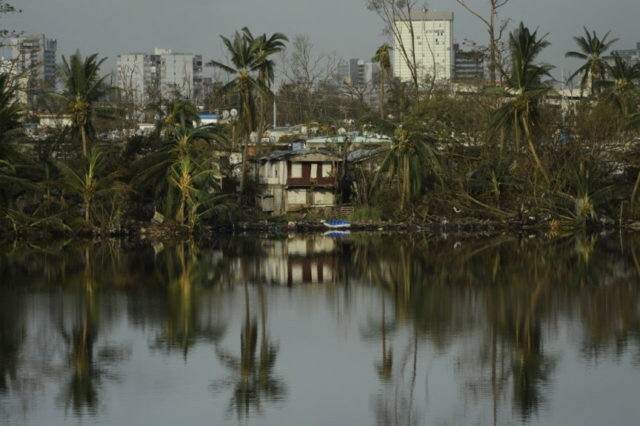 Officials with the Federal Emergency Management Agency, which is in charge of the relief effort, said they would take satellite phones to all of Puerto Rico’s towns and cities, more than half of which were cut off following Maria’s devastating crossing of Puerto Rico on Wednesday. AP reporter Christopher Gillette contributed from Guajataca, Puerto Rico.